At the turn of the twentieth century, in a rural stretch of the Pacific Northwest in the foothills of the Cascade Mountains, a solitary orchardist named Talmadge carefully tends the grove of fruit trees he has cultivated for nearly half a century. A gentle, solitary man, he finds solace and purpose in the sweetness of the apples, apricots, and plums he grows, and in the quiet, beating heart of the land--the valley of yellow grass bordering a deep canyon that has been his home since he was nine years old. One day, while Talmadge is in town to sell his fruit at the market, two girls, barefoot and dirty, steal some apples. Later, they appear on his homestead, cautious yet curious about the man who gave them no chase. Feral, scared, and very pregnant, Jane and her sister, Della, take up on Talmadge's land and indulge in his deep reservoir of compassion. Yet just as the girls begin to trust him, brutal men with guns arrive in the orchard, and the shattering tragedy that follows sets Talmadge on an irrevocable course not only to save and protect them, putting himself between the girls and the world, but to reconcile the ghosts of his own troubled past. There are books that are exciting, or fun, or dramatic, or frightening. This is a book that is beautiful. I was drawn in at the first chapter, which is unusual because the first chapter is basically a physical description of Talmadge. Coplin's style is lyrical and skilled. The characters she creates are so human that they almost jump off the page. Talmadge is a deep man, who says little but feels much. Jane and Della's tragic back story is told in a steady pace that works well within the structure of the plot. I especially like Caroline Middey, the town midwife and Talmadge's closest friend. She was a no-nonsense woman who seemed to be years before her time, yet I know that she had a story hidden in her past that Coplin hints at and uses to breathe life into Caroline Middey. Coplin also has a knack for creating place. I could clearly see the landscape of Talmadge's orchard. Once I finished this book, I looked up the town that served as the setting of the novel and realized that I had driven through it a few times in the past--and it exactly match the picture Coplin painted in my imagination. This is a character-driven novel, which I enjoy. However, for those who prefer plot-driven novels, they may find this to be a bit slow. I would urge those readers to stick with it, as The Orchardist tells a heart-warming, and heart-wrenching tale, and the human need for relationship. I'm glad to see how much you enjoyed this one! Just came across your blog, and wanted to say - I think it's great. 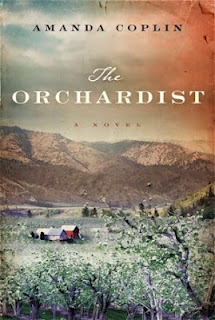 Looking forward to reading The Orchardist myself - glad u liked it.